Today, on a beautiful day 17 years ago…the world changed as we knew it. Students – I realize most of you do not have memories of this event nor did you live this day vividly. But you can learn from those that did. Listen and learn from stories of others. They are woven together as the fabric of this United States of America. Never forget moments and days like these. In order to show our respect and honor for the events and heroism of this day, the high school will together create a flag display. Each grade level will be called at a specific time this morning…at that time, please report to middle school cafeteria to pick up your flag and place outside. It was at this time, 8:46am, on this day, September 11th, 17 years ago that our nation was impacted forever. The first of two planes would hit the World Trade Center, beginning a series of attacks intended to get to the soul of America. We were terrified, angry, desperate, humbled, sad…and then strong, kind, selfless, proud and most important, resilient. We stood together as first responders saved countless lives. We remember the thousands of lives lost today and will never forget. We also remember those that ran toward the devastation in hopes of providing assistance, while thousands fled to safety. 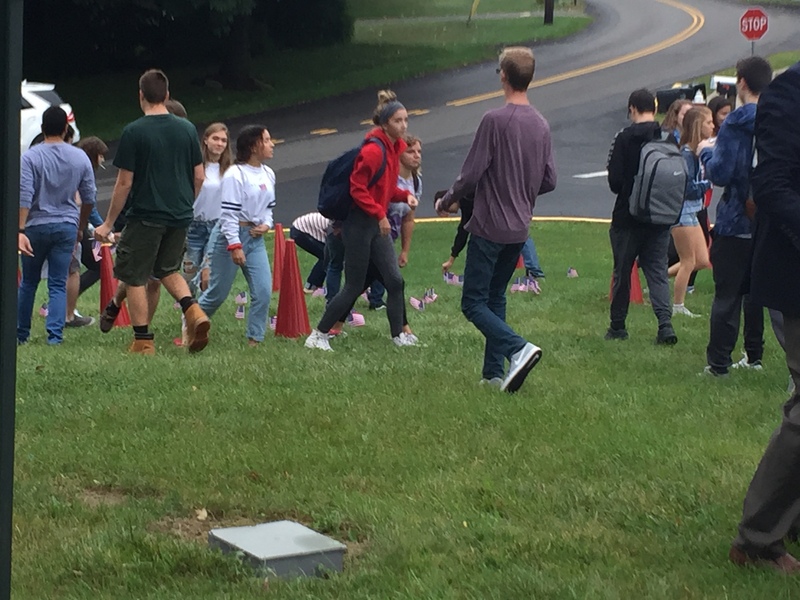 In between, students were provided flags to plan alongside Josephs Lane to honor the events of the day. Students followed a plan outlined by Dwulit to staff the day prior. “Tomorrow is the remembrance of September 11th. More and more people are removed from a vivid personal experience as 2001 seems very long ago. It may have been 17 years ago, but it deserves recognition as a day of devastation, loss, strength, inspiration and human spirit that bonded us together as Americans. If you experienced the day, I don’t need to explain.” wrote Dwuilt. 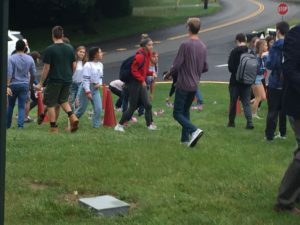 “As a way to honor and remember those lost and our brave first responders, all HS students will be given a flag to place out on the grass…to be seen from Josephs Lane. Following a brief announcement, students will be called out of Mod A to place their flags. Flag pick up will be as they exit the MS Caf doors when called, then returning back through the main HS entrance, hoping to cut down on student traffic and delays getting back in the building. Administrators and Officer Simcoviak will help with students placing flags safely. Many students participated, placing flags to commemorate an event that over half the student body was not alive to experience.